What's the first image that pops into your mind when someone says HDR? For most people, they think of dark, grungy, over-saturated images with halos surrounding every hard edge in the photo. The truth is, that's not actually HDR, but in fact, a form of Tone Mapping. To understand Tone Mapping we need to first explain HDR. So what is HDR exactly? Well High Dynamic Range images simply mean that the photo has more dynamic range in it than any camera (currently) can capture in one single shot. To be able to create a real HDR image, you have to take 3 or more photos at different exposure values. Typically one frame will be at a proper exposure, then the rest are overexposed and underexposed at various increments to let you capture the details in the brightest highlights and the darkest shadows. Then these images are merged together to create a 16-32 bit file. As I've explained in a few other blog posts and videos on our YouTube channel, most every camera available on the market currently has a sensor in it that can record information with a very specific dynamic range, (somewhere between 5-14 stops of light), which is FAR LESS than what the human eye can perceive. Therefore we combine these bracketed exposures together to create an HDR image. If you try to take a high contrast shot with a single exposure you typically end up with either completely blown highlights, or all details lost in the shadows. When you've taken a proper mix of exposures (under, balanced, and over), and merged them with an HDR software app, you're left with a relatively flat and low contrast image. This is where tone mapping comes into play. It's the process of converting the tonal values of an image from a high range to a lower one. For instance, an HDR file merged from multiple images with a dynamic range of 100,000:1 will be converted into an image with tonal values ranging from around 1 to 255. Why do we want to reduce that tonal range so much? Well the reason is simple. Most standard display devices (and printers) can only reproduce a low range of dynamic values (between 100 or 200:1 or lower). The goal of tone mapping is to reproduce the appearance of images having a higher dynamic range to fit/display properly on standard display devices, thus keeping the image looking realistic. The algorithms that tone mapping use to scale the dynamic range down attempt to preserve the appearance of the original image captured by breaking the information up into two categories: global and local. Global operators map each pixel based on it's intensity and global image characteristics. The process ignores its spacial location or if it's in a dark or light area. Using global only tends to leave you with a flat non-contrasty image after the conversion process. Local Operators uses the pixels location in the image when analyzing the appropriate scaling for it. This allows each pixel of a given intensity will be mapped to a different value depending on whether it's found in a dark or light area. Local tone mapping requires the system to look up surrounding values for every pixel mapped. This makes it slower (and more memory/system intensive), but leaves you with a much richer and eye pleasing image when correctly done. Does shooting in RAW matter? Short answer - YES! While you can still get amazing images from JPGs, tone mapping using RAW files provides much much much more information for the HDR program to work with. While it may take longer to process, you'll be left with a much more accurate image when working with RAW. When using Aurora HDR to merge your brackets, you're given one of the most human-realistic representations of the scene possible, and when using raw files, you have a TON of information and tools within your 32-bit image to generate a finished photo with the exact look and feel that you desire! The reality is, you don't need multiple exposures to tone map your image. You can have a single frame and create just as epic and breathtaking details, however, you will have less dynamic range to play with so remember that. This is why Tone Mapping and HDR are not the same thing! To create an HDR image, you need at least 2 bracketed images. It boils down to availability and style. It's up to you to create an image that's either realistic, or fantasy like. As photographers, we’re usually so busy working to get that “one” winning shot and move on to our next project, that we often miss out on a lot of incredible images we managed to capture. This is why at least once a year, it's good to take a week to dive back into old images to see if there’s anything incredible that you never even noticed when you shot them. It could be a great vacation photo, a breath-taking sunset, or even an out-take from a portrait session that just screams “look at me!”. Either way, it happens to the best of us, and just by taking some time to review your old image catalogues you could find fantastic images to play with. One of the great things about Aurora HDR Pro is that it’s not just for HDR. As you may have recently read inJoel Chen’s recent post about Automotive photography, you can use Aurora for a plethora of things besides just merging HDR brackets. It can add a specific flare and style. With just a few quick clicks, you can take an otherwise normal image and make it incredible. We're going to take Aurora HDR and revisit some images from the archives to make them great. As you can see here, we’ve grabbed a few images from David Crewe's 2014 Catalogue ranging from Vacation Landscapes, Cityscapes, and Portraits. It’s important to reemphasize that none of these come from HDR brackets. Starting with an image on an old point-and-shoot camera of New York City, you can see even though it’s not an HDR. We can use Aurora and it’s powerful layer tools to bring back a ton of detail otherwise lost in the image. With a few quick clicks to add a few new layers (for control) we’ve managed to bring back all the details from the shadows, enhance the skies while keeping the luminosity values and histogram in check. Lastly, we’ve added a layer to remove the noise added to the sky from pushing the HDR details and we’re left with an incredible image it's time to share for the first time! Given there are not one, but two Batman movies coming out soon, and also being inspired by David Lackey’s recent cosplay photography article, we decided to pull out one of old images of Rin’s Harley Quinn cosplay. We weren't quite sure how this was going to play out honestly, but in less than 5 minutes we were insanely excited, and here’s why. With just 6 layers, I was able to take a slightly overexposed portrait that previously I wasn’t sure what to do with, and turn it into a dark, dramatic, illustrated work of art! Starting with a Dramatic Preset (added into a luminosity mask to control its application), I then added a layer to boost my reds and yellows and applied a vignette. Next, we took the Tone curve to adjust the lights and shadows to pull the blacks down a little more and add some additional drama. Lastly, I added a new layer and used one of the awesome Macphun texture files on Overlay blend mode, then lowered the opacity to turn the image from a photograph, into an illustration. Lastly, we’ll take an image I shot of the Scripps Pier in San Diego at sunset. A single exposure that was a tad underexposed at the time…. originally it was flat. But something about the composition caught our eyes while digging through the archives. We again began working on a new layer to preserve the original file and added a luminosity mask with an intense Landscape preset to bring up all the details on the waves. Then, we used the Top & Bottom Lighting control to raise the brightness of just the waves as they were dark. We added a new layer for denoising the sky, as that is typically where you’ll end up noticing any noise generated from the HDR and Structure enhancements in an image. Finishing up, we added a color adjustment layer to enhance the reds and blues. The bottom line here is there’s no limit to what you can do with Aurora HDR, and it’s up to you to choose your creative paths. Just remember that you don’t need to actually merge HDR brackets to create an incredible image. Aurora HDR can quickly and easily take your single exposure images — even those in distant archives — from boring to breathtaking! It's here it's here it's finally here! My good friend and amazing Photographer & Retoucher has released her latest pro tutorial - Studio Beauty Video Training and it's nothing short of amazing! 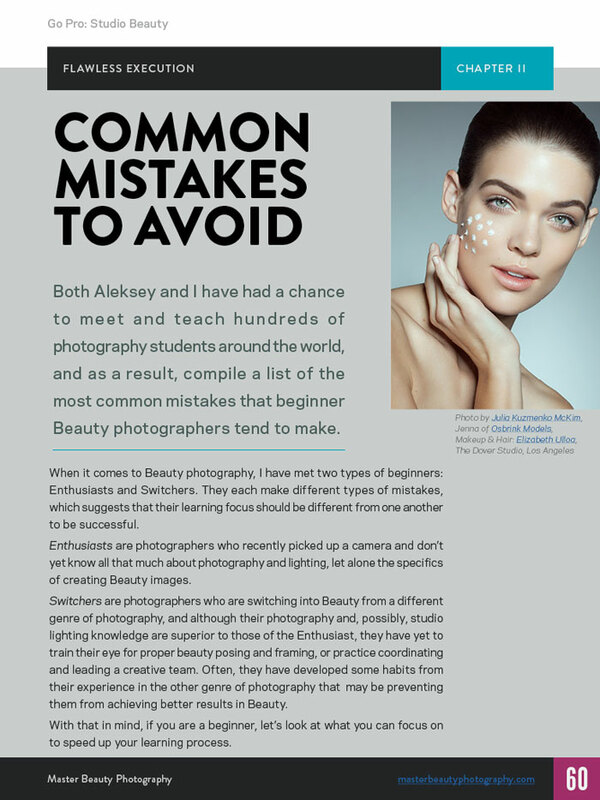 Julia Kuzmenko is one of America's best beauty photographers and retouchers. Her work has been seen millions of times, she's been featured in websites and international printed magazines countless times. While most will believe her work is as phenomenal as it is due to her retouching, (which _IS_ amazing), the fact is, she's an absolutely brilliant photographer and master of light! Thus, the announcement of this video tutorial! The video has 3 segments, (about an hour each), and an ebook, (Read that first! ), thats jam packed with information covering everything from beginner subjects like lens selection and strobes to Intermediate and Advanced topics covering workflow and technique! The thing i like about this tutorial is its focused on the artistic and technical aspects of the photoshoot on set, helping you get everything as right as possible in camera. This will make you AND your client happy beyond belief, and save your retoucher a lot of headaches! So be advised, this video will NOT cover retouching/post production efforts. As Julia says "Our goal is to teach you to confidently set up beautiful studio lighting and produce amazing images, as well as to lead your creative team and manage the creative process from inception to completion including selecting the right talent, working with models, make up artists and stylists for both commercial assignments and personal projects." Check it out now for the sale price of $169!! Classic Portrait Setup: Various Types of Lights, Light Modifiers, etc. Practice not until you can get it right, but until you can’t get it wrong. 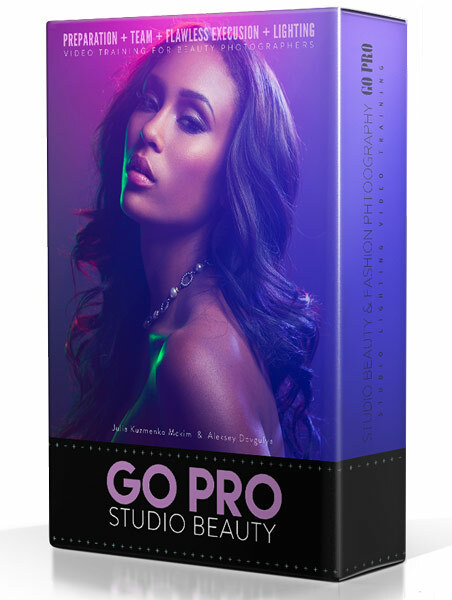 A 15-second overview that comes with the Go Pro: Studio Beauty video training.